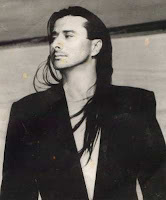 Could Steve Perry get any hotter in this video from the 1983? I love this song but oddly I always thought it was a Journey song. I must have brain damage. I have an excuse, I'm sick today. I have a sinus infection again. *must get antibiotics and go back to bed* PS I tried to embed this video and it gave me a closed tag error even though it shows up on the preview so I have no clue why it's doing that. You'll just have to click. Oh wait, he can get hotter!